With ClevaGroup’s Managed IT Support service you can be sure that your systems are monitored, supported and protected. An award winning IT Support company with over 10 years’ experience of delivering exceptional service to SME’s across all sectors. Managed IT Support, Hosted Desktops, Telephony, Office 365, Cloud Services, Disaster Recovery & Backup, Hosting, Procurement and data center facilities. Fixed monthly fee to ensure costs are predictable and on budget. Call 03333 448 300 to find out more and see much we can reduce your IT costs. REQUEST A FREE IT HEALTH CHECK! 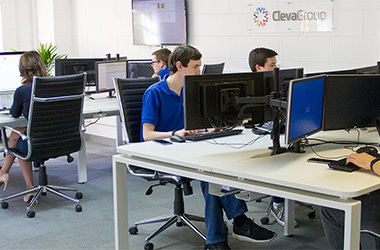 Clevagroup’s fully managed IT support service can take responsibility for your IT infrastructure, supporting and caring for it as if we were your very own IT department. Our team of Microsoft, Apple and CompTIA certified service desk engineers take care of cyber security, software updates and supporting end-users so that you can focus on your business, it’s hard enough succeesding in business without also having to worry about your IT. Risk free, 90 day money back guarantee on all managed services. We are committed to providing you the best IT Support. We’re big enough to deliver but small enough to care. Each and every customer receives exceptional service from us. Fully accredited Microsoft Gold Partner, Tier-1 CSP Partner, CompTIA Managed Services and 3CX Platinum Partner. Whats included in our Managed IT Support service? Trusted by 100+ businesses across Hertfordshire, Essex, London & beyond. We deliver outstanding Managed IT Support and Communications services. Located centrally in Hertfordshire our main office is ideally positioned to offer fast onsite IT support response to businesses in Hemel Hempstead. We’re already providing IT support for many businesses in Hemel Hempstead. Designated as a ‘New Town’ after the Second World War, in 1946 Hemel Hempstead is located just 24 miles (39 km) northwest of London. With a mixture of heavy and light engineering companies and a significant number of infotech and telecommunications companies Hemel Hempstead has excellent transport links with the A1(M), M40, M1 and M25 motorways, which allows us to be minutes away from of all the major Hertfordshire towns. Within easy reach of customer sites providing rapid onsite IT Support when required. 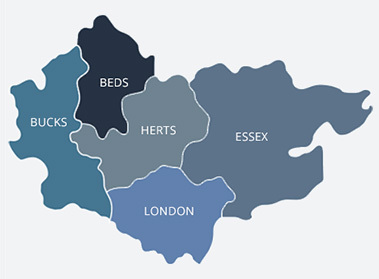 Our expert technical support is delivered throughout Hemel Hempstead via our true, Hertfordshire based live helpdesk. No call back service, an average wait time of just 13 seconds, direct access to our skilled and qualified engineers and an average first call fix rate of over 80%. We’re experts at providing IT Support, we know Hemel Hempstead, we know Hertfordshire, we know your business. With local engineers living in Hemel Hempstead experienced and accredited up to Microsoft Gold Partner, Tier-1 CSP Partner, CompTIA Managed Services and 3CX Platinum Status, we have what it takes to offer you the advice you need. So, if you have a business in Hemel Hempstead and are looking for first class IT Support in Hemel Hempstead or the surrounding areas? We would love to hear from you. You can send us your requirements using our Quick Quote form or talk to one of our experts today on 03333 448 300 (Option 2).